Collins on Bronson Koenig: He's a terrific player. We got a little fortunate that he was missing tonight. Collins: "We made a conscious decision to take away the paint." Badgers out scored in the paint, 26-12. Collins: We knew we had to earn it tonight and that's what we did. #Badgers Happ scoring last two games: 8 and 9. Previous five: 28, 14, 32, 14 and 20. McIntosh on Lumpkin's final dunk: That's a great punctuation ... It probably wasn't the right play, but it was a dagger. PSA on handshake line. I'm writing/filing ASAP. Don't have the luxury sit back and watch that. Gard: Knowing that we're marked is good for us ... Nothing that happened in this game is surprising in areas we need to improve upon. Gard said Wisconsin's turnovers "ignited them" in the first half, especially during that 16-0 run. Gard: It was a timely rebounds more so than anything else. Gard called Bryant McIntosh the "best player on the floor, hands down." #Badgers Gard of McIntosh: Best player on the floor -- hands down. Gard on Koenig: "I think he's OK mentally. I think the injury is a factor." Said the senior is struggling accelerating off screens. Watch the highlights from the #B1GCats upset over No. 7 Wisconsin. Happ on handling the double teams: I just need to continue to get the ball out sooner than later and not let them collapse on me. Showalter on defending McIntosh: He's a heck of a player, made a lot of tough ones and he was the best player on the court tonight. Happ says the committee had zero effect on the game today: "I don't think they should even do that stuff but it had no effect on our team." 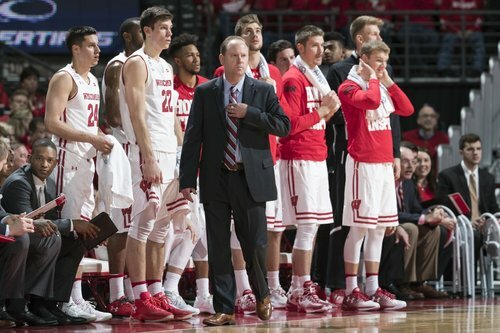 Hayes said the same mistakes #Badgers overcame in victories finally caught up to them. Not just missed shots.